To continue our long tradition of commissioning and publishing new work, we have created a new Curated by Proboscis library which will, from now on, be where all new commissions and featured eBooks and StoryCubes will be listed. This website (the Diffusion Library) will remain online indefinitely as an archive of more than 12 years of pushing the boundaries of what we think of as publishing and creative practice. 10 years ago this month we published the very first series of Diffusion eBooks, Performance Notations, launching our particular brand of hand-made hybrid digital/paper publishing on an unsuspecting public. Over the past decade we have followed that series with several others of our own (and a few by partners and collaborators) such as : Species of Spaces, Liquid Geography, CODE, Short Work, Topographies and Tales & Transformations and published well over 400 eBooks (and nearly 200 StoryCubes too). In 2002 we published the design schematics allowing others to create their own Diffusion eBooks (with recent updates for all 4 design variations and right-to-left reading too) and followed that in 2006 with the first version of our online web application for creating eBooks & StoryCubes, the Diffusion Generator. Hundreds of eBooks and StoryCubes were created (not all published here) by its users over a two and a half-year period. For a more in depth history of Diffusion read this post from 2007. In 2008 we won a small grant from the Technology Strategy Board to build a new prototype service that would be vastly more powerful and flexible than the old Generator – what eventually became bookleteer.com. The alpha version was launched at the end of September 2009 and we now have several hundred users who have created almost one thousand eBooks and StoryCubes with it during its first year, including some in languages such as Arabic and Hindi. In the past 6 months we’ve rolled out lots of new features, such as new sizes, customisable front covers and our exclusive Publish & Print On Demand service. We have also created a crowdfunding scheme for collaborators, partners and friends to support bookleteer’s technical development, Alpha Club. We’ve run a series of events, Pitch Up & Publish, introducing bookleteer to new users – both in our own studio in Clerkenwell and around the country with the Empty Shops Network. To kick-off Diffusion’s next decade we’re devising a new series of events, Pitch In & Publish, and adopting a new model of participatory publishing for our curated series. Rather than selecting individuals to create eBooks as we have done for previous series we will host events where people can collaborate in designing and creating a series of publications with others. Proboscis will define the series theme and individual topics for each issue, which will be put together during a one-day event. We will be publishing the collaborative publications (which could be an eBook or a series of StoryCubes) on this site and we will be inviting the participants to use bookleteer to create their own personal contributions to the series. A limited edition run of the publication will be printed using the PPOD service for participants. 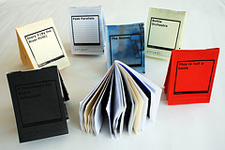 Pitch In & Publish will launch in October 2010 with the first series, City As Material. Topics will include: river, streetscapes, skyline and underside. 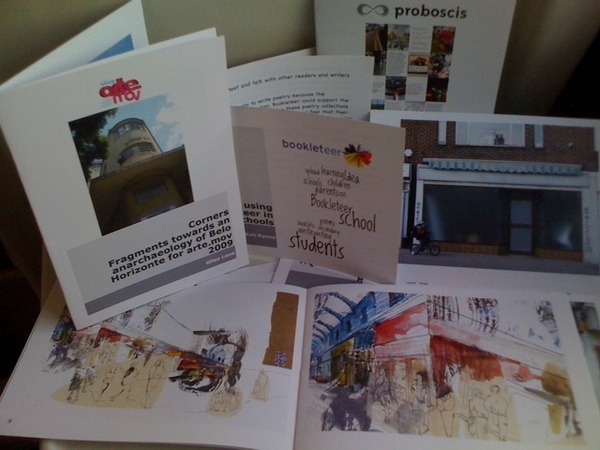 Proboscis wishes a happy and productive 2010 to all our Diffusion readers and contributors. This year we’re hoping to take Diffusion eBooks and StoryCubes to new heights with bookleteer.com and some exciting new services we’ll be announcing in the Spring. 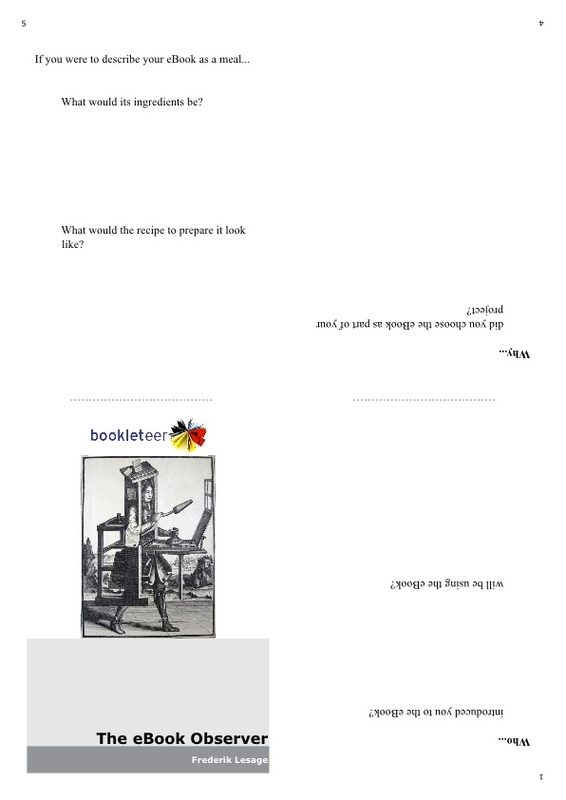 Meanwhile we’ve just published a case study by Kati Rynne on using bookleteer as a creative writer over on the bookleteer blog and yesterday we heard from Thomas Mailloux in France via Twitter that he’s created a library exploration field notebook for his students. We’d love to hear from other users of the Diffusion notebooks (and bookleteer) about what they use them for too. 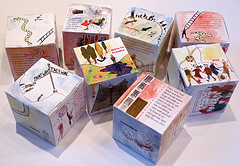 If you’d like to use bookleteer.com to create your own Diffusion eBooks and StoryCubes please write to us at bookleteer [at] proboscis.org.uk for a test account. The first event was a fun evening and everyone who attended created at least 1 eBook each, with the exception of Matthew who managed to create two lovely examples. Thanks to everyone who came (Christopher, Fred, Kati, Matthew & Sara), and the team (Karen, John & Stefan). The next Pitch Up & Publish will be on Thursday 5th November 2009 at our studio in Clerkenwell. Starting in October we will be running regular informal evening workshops for people to literally pitch up and publish using bookleteer.com. Initially these will be held at our Clerkenwell Studio for up to 15 participants – all you need is a laptop and some content (text /photos/ drawings etc) you’d like to create and share as eBooks or StoryCubes (shareables). We will provide free user accounts to bookleteer and guide you through the steps of preparing and generating your shareables to share online, via email or as physical publications. Once created you can publish them on your own website or, if appropriate, we can publish them on Diffusion. The first workshop will be held during the week beginning October 12th 2009 (date tbc) between 6.30-9pm. Participants will be asked to make small donation to cover materials and refreshments. Hi Sho, the Generator/Bookleteer service is not yet public. I'll contact you separately about how we might help. With the residency I was looking for ways to expand my use of Web 2.0. The eBook Generator provides a useful format in which to distribute essays to those who prefer not to read longer pieces online. Therefore I was looking to integrate producing eBooks with my activities on social networking sites such as Facebook, while simultaneously drawing some of the audience that exists for the eBooks as a project in itself towards my own online activities. My approach to this was to produce material that I felt would be of interest to my audience both on social networking sites and beyond them covering new(ish) material on subjects I’ve had a long interest in, including the London art world and psychedelic drugs. However, I adapted my material after discussion of the eBook project with Giles Lane. Giles not only showed me how to use the Generator, we also had several long conversations about building an audience for this project and how what I was doing might fit into this. Taking part in this process reinforced my view that it is possible, if sometimes difficult, to move an audience from one web based content delivery platform to another. Sometimes this is a matter of moving with shifts in web usage. I moved to Facebook ahead of much of the audience I’d previously built on MySpace – but as the shift from the latter social network to the former built, most of my old audience followed me. Getting people using Facebook to download from the eBook Generator or to look at material on other social networks such as YouTube is not as difficult to get them to look at traditional websites. However, the overall lesson was, as ever, persistence pays off. Rather than changing the way I worked, this reinforced my view that I’d been using the internet in an intelligent manner. In the future I’d be interested in looking at ways in which I might use the Generator to develop my work as a novelist. It would be interesting to create a serial style novel to be delivered chapter by chapter via the Generator. This would, however, be a major commitment and in my view would require some extra funding to promote it in order to reach a large enough audience for the amount of effort involved to be worthwhile. I found Giles and his team very productive to work with, but also great fun – and I enjoyed my free ranging lunch break conversations every bit as much as the actual work! what do you use them for (personal reading/set texts for students/research/inspiration/gifts etc)? how would you review a particular eBook or StoryCube? do you design your own eBooks using, or inspired, by our schematics? 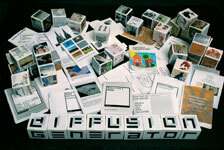 would you like to create your own eBooks or StoryCubes using the new Diffusion Generator? what kinds of eBooks/StoryCubes would you like to see us commissioning? how can we make this site and the library better, easier to browse, more accessible? Please feel free to reply using the Reviews/Comments section of this post or a specific eBook/StoryCube you want to comment on. Thanks. We’ve just added a Translation plugin to Diffusion (in bottom bar) which offers a Google Translation of the site in over 40 languages. We have been testing the system since late March and shortly will publish some eBooks created recently using the new Generator to demonstrate some of the new formats (e.g. landscape and ‘book’ binding options). Meanwhile we are fundraising for the next stage of development to build a web interface for individual access, as well as some demonstrator projects with 3rd party partners (a museum, a university, a data aggregation platform, a visitor attraction centre) exploring how institutions might use the Generator to offer “tangible souvenirs” of digital experiences. The “tangible souvenir” concept has been developed by Proboscis over the last couple of years based on our own experiences of creating projects that engage people with digital technologies (e.g. Urban Tapestries, Snout, Feral Robots etc) but which require digital technologies (e.g. a web browser) to review. We frequently find that people want to refer back to an experience with others but are often in a place (the pub, a cafe, over the dinner table etc) where they don’t have access to a suitable screen or fast web connection for showing what they experienced. The idea behind “tangible souvenirs” is simply to create physical outputs culled from digital assets created or engaged with during a ‘digital’ experience (such as using an interactive museum guide). A personalised eBook or StoryCube is then provided which can be kept in a pocket, passed around, given away and re-created as often as the person likes. In Autumn 2008 Proboscis won a Feasibility Study grant from the Technology Strategy Board to investigate the potential for third party sites to add access to our Diffusion Generator online software to their systems, enabling their own users to be able to create and publish eBooks and StoryCubes directly from their sites. Over the next couple of months we will be developing a re-engineered prototype of the Generator designed to allow 3rd parties to hook into it through an open API (Application Programming Interface) and offer their own users eBook and StoryCube creation. As the popularity of Diffusion grows – we have now passed an average of 110,000 downloads per year – Proboscis needs to develop sustainable revenue streams (e.g. from licensing the API to 3rd parties) to keep Diffusion going, and to create successful and meaningful partnerships with potential users (museums, galleries, universities, companies etc) who wish to add this unique publishing system to their own sites. The feasibility study and the re-engineered Generator will enable us to model these potential revenue streams and demonstrate a functioning service to other potential partners. Later this year we aim to unveil the new Diffusion Generator and welcome expressions of interest from organisations and institutions who would like to test the API. I’ll be at BookCamp on January 17th and would be delighted to hear from anyone interested in working with us. why are we who we are? what do we want to become? Transformations is the latest series of Diffusion commissions curated by Proboscis. 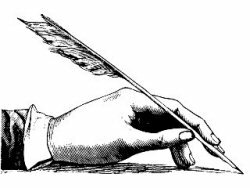 Proboscis is commissioning a diverse range of writers, artists, performers, thinkers and makers to respond to two questions from different perspectives, why are we who we are? and, what do we want to become? As we get into the swing of the 21st Century our notions of identity, personal and societal, are subject to new arrays of emerging pressures and responsibilities. Our aspirations for change and growth are being re-thought as we grapple with the growing awareness of environmental changes which may already be beyond our control. How have we reached this point? Where do we go from here? Transformations seeks to address these fluid notions of identity and aspiration by commissioning works that subtly reflect on individual identities, urban identity and pharmaceutical, biological and technological interventions. Over the next few years we will be inviting selected contributors to add their voices into this mix – through essays and artists books (eBooks) as well as in three dimensions (StoryCubes). For the first time we are experimenting with a new approach to selecting works for this series – publishing as a conversation. Readers are invited to submit their own proposals for the series (through the comments section of this site) – we will provide accounts for the Diffusion Generator (soon to be re-launched as Bookleteer) for readers to become authors and create their own eBooks or StoryCubes, the best of which we will publish as contributions to the series. We are not asking for quick responses, but for measured and considered contributions to the series – putting an eBook or a set of StoryCubes together is significant creative act. Get in touch if you are inspired by the works we have selected and published so far and have a proposal for a work of your own. We are seeking a sponsor for Transformations who shares our ethos of collaboration, public authoring and creating cultures of listening. Please contact us for more information. 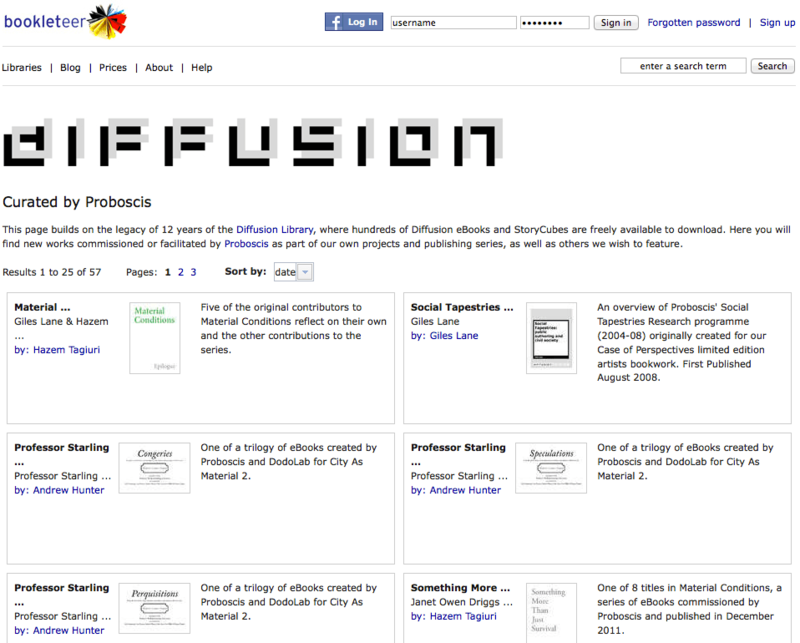 We’ve added a new feature to the Diffusion Library: browse by author. Combined with the categories, tags, series and chronological list of eBooks and StoryCubes this should make the library even easier to use. We’ve been experimenting over the last few weeks with yet more ways of personalising and customising the eBooks. Using a variety of papers and techniques of scanning and printing on top of other images we are building a library of highly personal copies of the eBooks – many of which we showed at the scissorspaperstone artists book fair on April 12th. Short Work consists of public domain texts sourced from Project Gutenberg re-published as Diffusion eBooks. As the title suggests, each is a short work of fiction, poetry or prose intended to be enjoyed in those frequent moments of inbetween-ness that punctuate modern life. The initial selection includes works of satire, experimental writing and poetry chosen for their continuing power to affect the way we see the world. 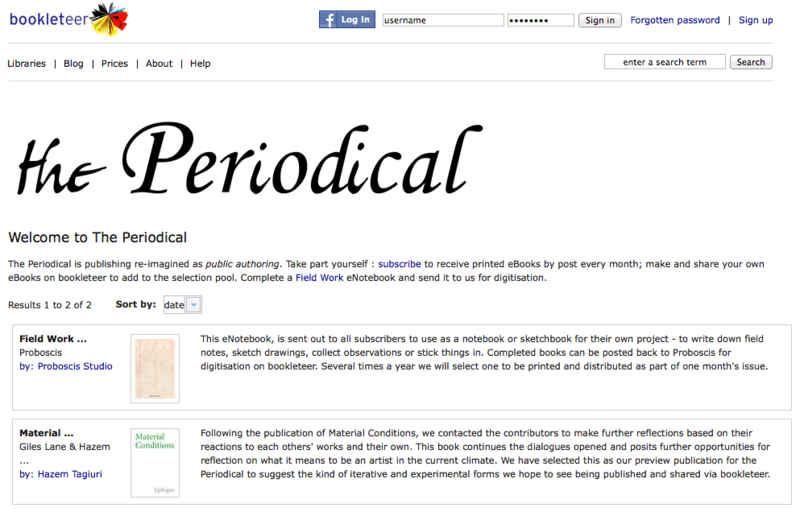 Update (13/04/2008) : We’ve invited several friends and collaborators to choose their own public domain texts to re-publish as Diffusion eBooks which we’ll be posting every month or so. Today we’ve added the first of these, selected and introduced by technology critic and journalist Bill Thompson, who has chosen Three Essays by Samuel Johnson. Update (05/05/2008) : Alex Steffen, editor of Worldchanging, has selected and introduced Common Sense by Thomas Paine. Proboscis is offering a programming internship/placement for someone seeking experience in helping build a unique platform for public authoring and sharing. The Diffusion Generator, our prototype ‘publishing-on-demand’ platform for creating eBooks and StoryCubes, is entering its next stage of development: extending the current capabilities and opening it up to a much wider user group. Proboscis particularly welcomes applicants from culturally diverse backgrounds. We are looking for someone who is familiar with Python and has experience of developing cross-platform web applications. Experience of using the Zope development platform and Plone CMS is also highly desirable. An internship would be 2-3 days per week for 3 to 6 months, depending on your availability. If you are interested in helping develop the Diffusion Generator but if an internship or placement isn’t suitable for you, please get in touch to discuss volunteering opportunities. One of the most transformational aspects of Diffusion as a platform for publishing-on-demand is our ability not only to commission and publish new writing and ideas, but to enable other people to participate by creating their own eBooks and StoryCubes through the Generator and have them included alongside commissioned authors; publishing as a conversation rather than a privileged monologue. We have been interested since the late 1990s in utilising network technologies to create alternatives to the traditional ‘centre to the margins’ nature of the media; the broadcast and publishing model sustained since the 19th century and only beginning to be seriously challenged in the late 20th Century through the rise of the internet and its distributed network structure. We have been exploring how, through concepts like ‘public authoring’ and ‘cultures of listening’, we can create new ways for people to participate more widely in the creation of the cultures and societies they live in – such as in our Urban Tapestries project and Social Tapestries research programme, as well as our current Anarchaeology projects (with Render in Canada & ICE in Australia). A key feature of future series of Diffusion commissions will be this conversational aspect – where we will be inviting the public to participate in the series by using the Diffusion Generator to create eBooks & StoryCubes of their own – the best and most relevant of which we will include in the series alongside the authors we commission directly. This will be different to the kinds of conversation that happen through blogging and commenting – creating an eBook or StoryCube is a much more considered affair, requiring time and reflection to create what is, after all, a publication that exists not only on the web but as a physical entity too. The first of these ‘conversation series’ will be Transformations – we will be announcing the initial commissions in April and publishing the outcomes later in the year, inviting contributions from the public once the first 3 or 4 are available. Watch this space. These are images illustrating some playful printing experiments we have been doing in the Proboscis studio with the diffusion eBooks. 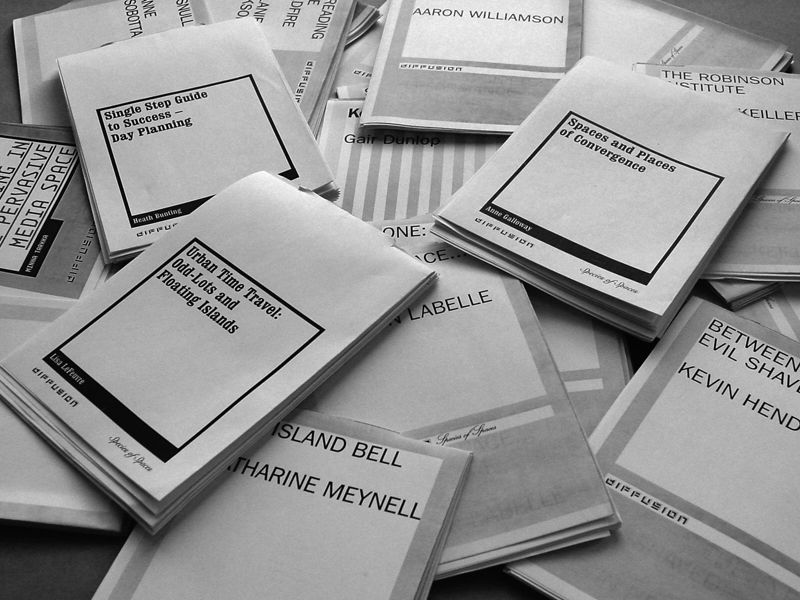 After choosing a few of the published eBooks we have been printing these on a range of different papers such as colour papers, notebook sheets, black card, tracing paper… trying to enjoy the making up of the eBooks as a personal and playful experience. Some of the outcomes show these transparent effects resulting from using tracing paper combined with colour paper. All papers have been previously printed with a big image on one side and the usual printing process on the other side; this gives the effect of illustration for a full text eBook. This is an example of cover and inside page of an eBook printed in a regular black and white process on black card combined with tracing paper already printed with a picture. This is just a way to relate the eBook content with the personal choice of paper and images. Similar process has been done in this one with blue and tracing paper for a narrative story. These experiments demonstrate how easy and fun it can be to personalize and customize the look and feel of diffusion eBooks through the choice of different kinds of papers to print on. It adds a further dimension to the handmade nature of the eBooks by showing how the incorporation of your own choice of images makes your individual copies unique. We’ve been working to improve both the illustration and instructions on How to Make Diffusion eBooks. The fruits of our efforts are now online and we welcome feedback from readers regarding their clarity or ways they could be made even better. The wonderful new illustrations have been created by Carmen Vela Maldonado who is currently on an internship with Proboscis. This year Proboscis is planning to commission a new series of Diffusion Shareables, Transformations, and to run a further programme of case studies with both UK and international participants. The theme of the new series is Transformations – we are planning to commission 10 new titles (both eBooks and StoryCubes) which reflect on the construction of identity: how and why we are who we are. What changes or transformations have we made to become who we are, or who we wished to be? The contributors have been asked to consider the theme from either a personal or a more societal point of view. We aim to announce the list of contributors in April. This year’s case studies are also themed around two key areas: schools/education and museums, libraries and archives. Over the next few months we will begin inviting participants from professions engaged in these areas (teachers, librarians, archivists, curators etc) to explore with us how the Diffusion ethos and tools can be harnessed to deliver innovative benefits for their communities. The international case studies will form a key part of our forthcoming Human Echoes programme to create and share bodies of knowledge across cultures, geographies and communities about different attitudes and practices of looking after our human and social ecologies – environmental stewardship. What impact can the collection and sharing of these knowledges have, especially by people in developing countries or indigenous communities who have previously had limited access to publishing and sharing technology? Can this point to next practices in developing local dialogues around sustainability in a global setting? How can the Diffusion ethos of public authoring, cultures of listening and its hybrid digital/material tools effectively contribute to greater dialogue and understanding between global communities? We are seeking funders/sponsors and partners for these projects – do please get in touch if you would like to support Diffusion or collaborate on the projects. We hope these changes allow visitors to enjoy the full range of Diffusion titles more quickly and simply – do please send us your comments and suggestions. Proboscis and Render are currently running a mixed graduate/under-graduate studio and seminar course at the University of Waterloo (Ontario, Canada) based on our concept of Anarchaeology. 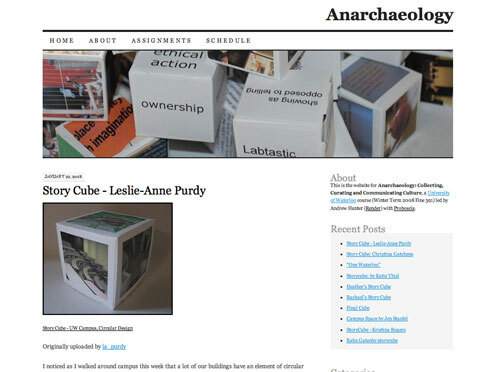 Over the next 12 weeks the students will conduct individual and group investigations into the environment of the university, Kitchener-Waterloo and the local region and, through a series of assignments, build up a body of artefacts (StoryCubes, postcards, eBooks, podcasts) for exhibition. A course blog will act as a repository of research, fabricated artefacts and discussion.